As part of the SCENICC program, DARPA researchers are working on futuristic contact lenses that will offer a dual purpose. These lenses will allow users to focus on objects that are close up and far away simultaneously, while enhancing normal vision by allowing a wearer to view virtual and augmented reality images. Currently being developed by DARPA researchers at Washington-based Innovega iOptiks are contact lenses that enhance normal vision by allowing a wearer to view virtual and augmented reality images without the need for bulky apparatus. Instead of oversized virtual reality helmets, digital images are projected onto tiny full-color displays that are very near the eye. 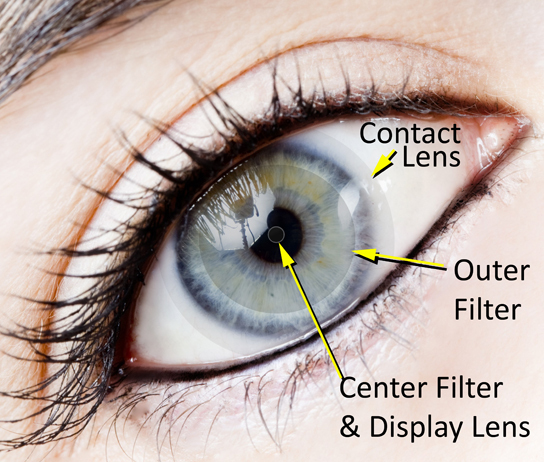 These novel contact lenses allow users to focus simultaneously on objects that are close up and far away. This could improve ability to use tiny portable displays while sill interacting with the surrounding environment. Developed as part of DARPA’s Soldier Centric Imaging via Computational Cameras (SCENICC) program, SCENICC’s objective is to eliminate the ISR capability gap that exists at the individual Soldier level. The program seeks to develop novel computational imaging capabilities and explore joint design of hardware and software that give warfighters access to systems that greatly enhance their awareness, security and survivability. Be the first to comment on "Researchers Designing Eye-Enhancing Virtual Reality Contact Lenses for Soldiers"